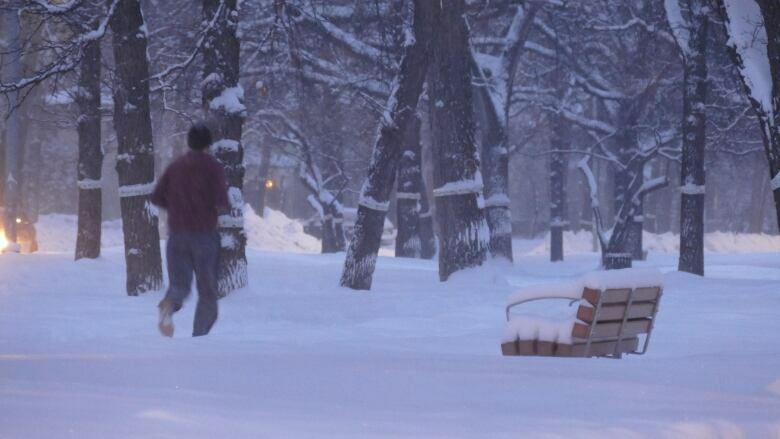 Winnipeggers are waking up to warmer weather and more snow. An 18-day streak of temperatures below –10 C came to an end Tuesday morning at a balmy –9 C.
But there's still the snow to contend with. Environment Canada says four to five centimetres of snow fell across southern Manitoba overnight. Another two centimetres is expected to fall before the system moves on Tuesday afternoon. Winnipeg got seven to eight centimetres from Monday night to Tuesday morning, said CBC meteorologist John Sauder. After one snow-free night, another system is expected to move in with more snow and colder temperatures Wednesday morning. Sauder expects Winnipeg to see another two to three centimetres on Wednesday.